Quite possibly the oldest marketing/advertising book that I’ve read so far (ding, dong!) this baby was first published in 1965. 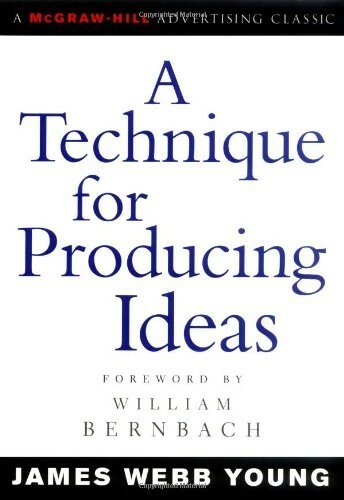 I got onto it via a blog that recommended it as a complete classic and an excellent example of how to produce ideas. Being an idea-junkie myself – I pounced. I often find that while ideas, innovation and change are valued in business, we rarely examine how these ideas come about. Instead we label someone as being great at coming up with ideas, or being crap. In reality there’s a process for coming up with ideas, and if you work at it, you’ll get it. If you like this idea-making side of creativity then I also recommend giving Hey Whipple a read – another fab creative book and one that describes a creative process that is very, very similar to the one below. Summary – five step technique for producing ideas! For a bit more on the process, check out the book here.